I know some of you have made the Labyrinth quilt. Did you find the instructions a little lacking? I'm sure I can figure it out, but I'm glad it's not my first quilt. I can't make any errors - I had 1/2" of background fabric left after cutting. Hmmm, no picture icon so I can post the picture. I was reading the directions last night. I think it would have been helpful had the designer had spelled out exactly how many strips should be cut esp for the white. 1.25” strips. So getting the calculator out. There has to be a more efficient way to cut out the pieces for this project. It gives me a headache just reading the cutting “chart”. .... Hmmm, no picture icon so I can post the picture. They're here now. I posted pictures yesterday so it was odd they disappeared temporarily. Thank you for the reminder on how to recover them if it happens again. I found my first error - I cut 16 squares instead of 20. When I went to cut more, I didn't have a scrap wide enough, so four are going to have a seam. That's what I get for making the table runner with the leftovers before I made the quilt. Last edited by Irishrose2; 04-29-2018 at 04:04 AM. I love that block and the colors. That is the pattern picture. Mine will be almost the colors of the Spicy Spiral table runner I posted yesterday. The quilt is going to the same couple. I'll definitely be watching for your posts and updates. I have this pattern and have started gathering the fabrics. Guess I better read the directions carefully! Anniedeb, The directions are okay - there just aren't many. Actually, it seems like an easy quilt because the pieces are so large. Sandygirl, the Labyrinth Walk is a wonderful quilt, but I won't be making one. I have a reversal problem and I think that one would be a problem for me. Besides, this bride is a country girl - that quilt wouldn't suit her. I assume your pattern is new enough to have the correction in it. Yes...I have the corrected pattern. My husband saw it on Facebook and requested it. 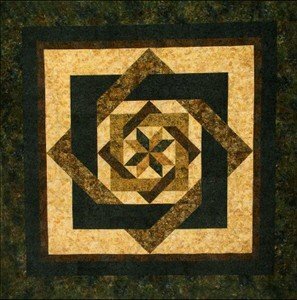 I love illusion quilts and this one is pretty awesome but it was not on my “must do” list. But since DH loved it, I told him I would make one for him. I started cutting out the 1.25” strips last night. I just finished this quilt, made it for my daughter in purples & greens. I will never ever make another one. Actually my sister in law and I each made half(we live in MO and CO) and got together and put together. It turned out great. We didn't have a problem. my daughter and I made this quilt as a wedding guilt for her daughter and it was wonderful. the most confusing part was starting from the middle out instead of in rows. it took us several years to finish as we go to retreat together once a year for 5 days. Always so many other things to do too!